As the post-Splendour In The Grass blues really start to kick in, triple j have finally shared footage of the moment Alex Dyson joined The Wombats on stage during their set. The kicker? He was dressed as Harley Quinn circa 2016’s Suicide Squad for some reason. 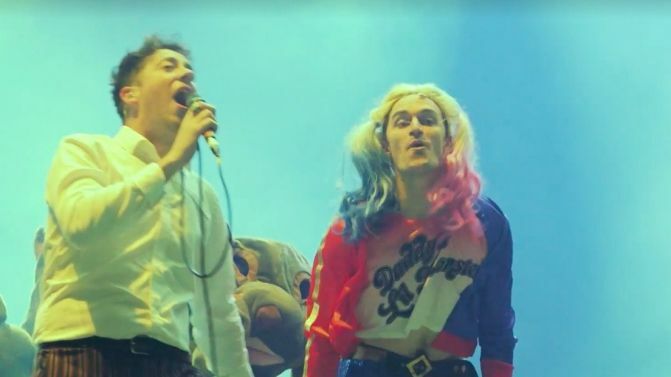 As The Wombats broke out into the bridge of their massive song ‘Let’s Dance To Joy Division’, a happy yet unsuspecting crowd were surprised when four people dressed up as wombats and Alex Dyson dressed as Harley Quinn erupted on to the stage. That man can jump very, very high. Check out the band’s full performance of ‘Let’s Dance To Joy Division’ below as well as Dyson’s Instagram post.